In this fun class, you will make a versatile gift card holder using a unique folding technique. Once learned, the variations for this project are endless! You will also learn how to use Sparkle N Sprinkle glitter to create beautiful backgrounds – a technique you can use over and over again in your card designs and more. 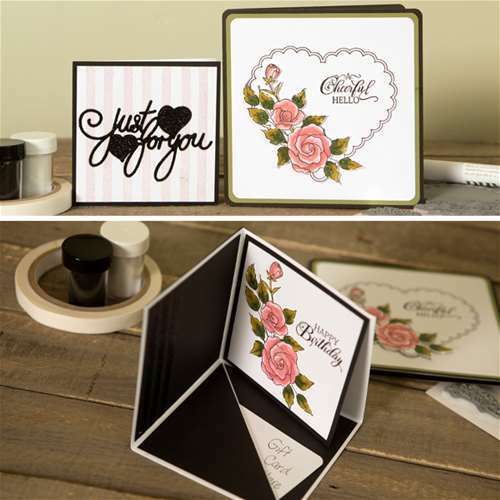 We will send you home with a stamp set, supplies to create another gift card holder and two bonus cards, and directions on how to create the perfect liner. So come join us and be inspired! What products will be highlighted: Sparkle N Sprinkle glitter, stamps, dies, and adhesive. What will I learn or complete: One Happy Birthday gift card holder., plus materials to make a second gift card holder and two bonus cards. You will also receive a rubber stamp set, two glitters, Tonic glue pen, and a special discount coupon to use in our booth. What do I need to bring to class: Paper trimmer, detail scissors, bone folder, 2 x 3" acrylic block or stamp platform, black Versafine stamp pad, and baby wipes. What techniques will I learn or use: You will learn how to make a versatile gift card holder using a unique folding technique along with variations of the technique. You will also receive instructions and materials to create two bonus cards using the stamp set and papers included with your kit. Will I complete this project in class: It is possible some people will finish the projects in class.